I am looking for more photos of this armour. All photos would be of interest to me, but close ups in particular of the gold and/or bronze castings would be nice. Does anyone know of any books or other sources that feature this harness? There's a photo of this harness a little closer up on page 38 of Medieval Craftsman/Armoupers byMatthias Pfaffenbichler ( ISBN 0-714112-054-4) .Its not real tight but you can see the details more clearly . I've added additional photos and info in the historic arms talk forum. This harness is well documented and appears in many, many publications of all kinds. In fact, it's amongst the most documented pieces from Negroli and a lot of black and white photos exist of it. 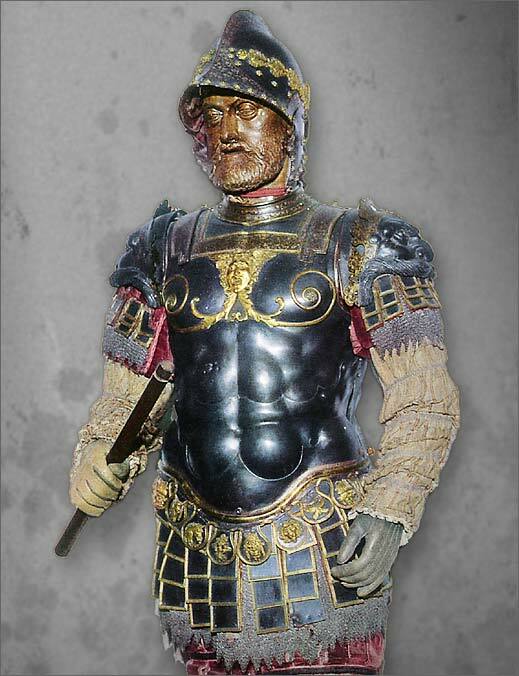 There is a lengthy article in a book published by the The Metropolitan Museum of Art called Heroic Armor of the Italian Renaissance - Filoppo Negroli and his Contemporaries. The book is still available new and can be purchased from Amazon.com for a reasonable price. Thanks! The pictures are fantastic and helpful. The book looks great too.